Synopsis: Jean-René, 35 years old, is the boss of a small chocolate factory of a dozen workers, successor of his father. For his employees, he is a distant, cold and mysterious man always avoiding direct contact, conflicts and social events. And yet, Jean-René lives in secret fear. Suffering from social phobia since always, he is terrified to speak in public, to answer the phone, to approach clients. He decides to hire an “efficient marketing person”: Angélique. She is 35 as well, professional, stern and confident looking. Yet, behind the mask, she is the exact opposite: an hyper emotive person suffering from social phobia as well and other troubles. 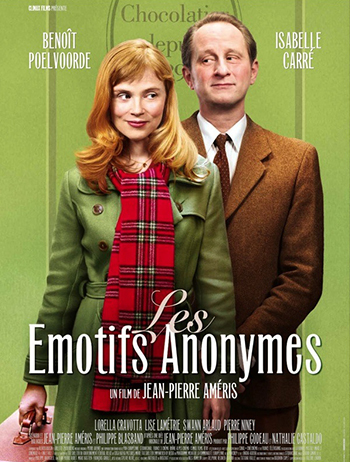 There is a single place where Angélique can breath, can unburden herself: at the Romantics Anonymous. In the frame of his behavior therapy, Jean-René must do in vivo exercices. As he recognizes his feelings for Angélique, he has to seduce her. A performance he never achieved before with a woman, always remaining alone instead of confronting his fears. This time, he will try… A great tandem of actors, reunited after 'Entre ses mains' ('In His Hands') in a blushing neurotic duo set in a chocolate factory.